After a year long wait here it comes again!! Yay!! Wondering whats the source of my joy?? Well its Durga puja (or "pujo" as in Bengali, which happens to be my mother tongue) here and its a time for religious frenzy and eternal ecstasy for Hindus!! Well,am not a religious person i.e. I am spiritual but I don't believe in idol worship or religion. Despite the fact,the joy and reverberating enthusiasm that envelops the entire Bengal during this time won't let even atheists to escape, you can't help enjoying and being a part of the entire celebration!! 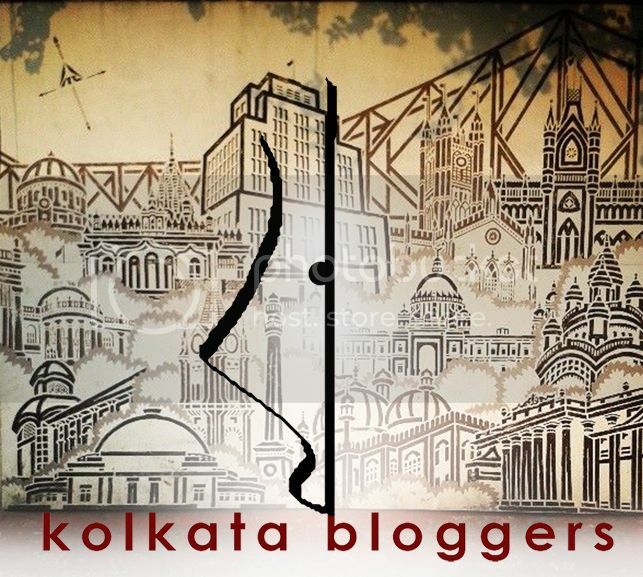 A li'l intro about it all- Durga Puja or Navaratri is the biggest celebration for all Hindus around the world,the celebration of Goddess Durga's (the ten armed Supreme Hindu Deity) victory over the demons in a battle for 9 days during which she takes different "roops" or forms to destroy evil. On the final day,she kills the king of the demons Mahishasura and establishes Good's victory over evil. It is believed that Maa Durga (or Mother Durga as we call her) comes to Earth,which is her parent's house from her heavenly abode for a visit for 9 days,returning on the 10th day, with her four children Kartik,Ganesh,Saraswati and Lakshmi (who also happen to be Hindu dieties). We mortals welcome her and celebrate her visit. 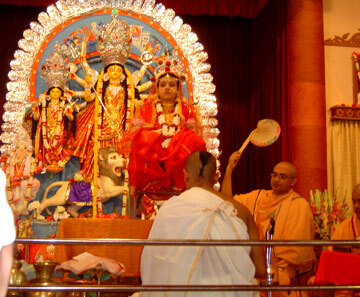 Namastastyai Namastastyai Namastastyai namo namaha "
This is a very important day when ritual preparations are made to begin the Durga Puja proper. These preparations are mainly three:Kalparambha, Bodhan, Adhivas and Amantran. Kalparambha : This ritual is done early in the morning. 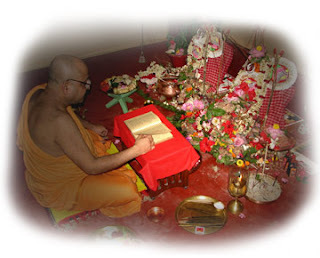 It is mainly an act of making thesamkalpa or ''sacramental intention'', the firm determination to conduct the Puja properly during the three days. The ritual consists of installing the ghata, water-filled copper pot, at a corner of Durga mandap and offering worship to Durga and Chandi. Bodhan: This rite is performed at the Sandhya or dusk. The word ‘Bodhan' literally means ‘awakening'. The Hindu mythology holds that all gods and goddesses go to sleep for six months during the southward journey of the Sun. Autumn (Sharat), during which Durga Puja is done, falls in the middle of this period. Hence it is necessary to first of all awaken the deity Durga. The awakening of Durga was first done by Sri Ramachandra who wanted to propitiate the Goddess before fighting Ravana (as in the Hindu epic Ramayana). The ritual of Bodhan consists in installing a water-filled copper vessel at the base of the Bel (Bilva) tree and praying to the Divine Mother to awaken. Adhivas and Amantran : These rites follow Bodhan. Adhivas means ''invocation''. Through Bodhan the Devi has awakened: now the awakened Devi has to be invoked in the Bel tree or branch of the tree. Adhivas is also a ritual of sanctification. The actual ritual consists of the following main steps. Twenty-six sacramental things (mangalik dravya) are sanctified by touching Devi Durga and the Bel tree with them. To ward off evil effects, a red coloured thread is tied around the altar where Puja is done. The above ritual is followed by Amantran which literally means ''invitation''. 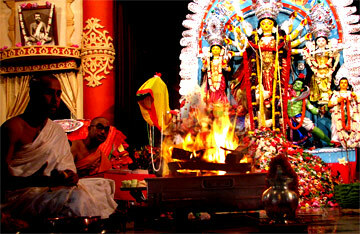 Through this rite the Devi is invited or entreated to accept the Puja the next day (Saptami). After this, Devi is worshipped with five items and Arati is done to Her. A living medium is necessary to invoke the indwelling of a deity. It is through a living medium that Divinity manifests itself. On the sixth day Divinity was invoked in the Bel tree or a branch of it. On the seventh day the Deity is invoked in a group of nine plants known as Navapatrika. The nine plants, which include a branch of Bel tree also, are bundled together, given a ceremonial bath, covered with an orange coloured cloth and installed on a wooden seat on the right side of the image of Durga. This is followed by Mahasnan (great bath) on a mirror, using various materials. After this, consecration and divinization of the image, known as pranapratishtha, takes place. This is followed by elaborate worship of the Devi with sixteen items (shodashopacharapuja). The other deities, attendants and other objects associated with Devi are then worshipped. The Seventh Day's Puja is concluded with bhog (food offering) and Arati to Devi. As on Saptami, on Ashtami also, Mahasnan and Shodashopacharapuja are done. In addition, nine small pots with flags of different colours attached are installed and the Nine Shaktis are invoked in them and worshipped. After this sixty-four yoginis are worshipped. Then one crore yoginis are worshipped. This is followed by worship of Nava Durga (nine aspects of Durga) and Goddesses Jayanti, Mangala, Kali, Bhadrakali, Kapalani, Durga, Shiva, Kshama, Dhatri, Svaha and Svadha. Ashtami Puja is concluded with Bhog and Arati. 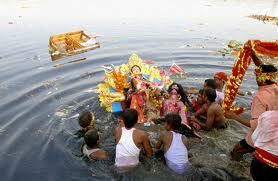 Kumari Puja : Worship of a young girl, treating her as Devi, is also a part of Ashtami Puja. Sri Ramakrishna has said that the Divine Mother manifests herself more in a pure-hearted girl and that is why Kumari Puja is done. He used to bow down before little girls looking upon them as manifestations of the Divine Mother. The same kinds of offerings made to the Devi are given to the Kumari also, and finally Arati is performed. Even senior monks offer flowers at her feet. Sandhi Puja : The last 24 minutes of Ashtami and the first 24 minutes of Navami (a total of 48 minutes between the two lunar days) constitute the Sandhi or ''Sacred Juncture''. It is considered to be a most auspicious time. At this time Durga is worshipped as Chamunda (that is, Kali who killed the demon Chanda and Munda). This Puja is considered to be the highest point in the whole Durga Puja and the most important ritual. It is customary to perform bali or animal sacrifice at this sacred juncture. This ritual is skipped at some places (as in Belur Math,India). The Dhunuchi Naach (a dance by the devotees with ignited copra with incense in an earthen vase) is performed during this Arati . The special food for this day are Luchi and Torkari (Luchi is deep fried bread and torkari means curry or a vegetable dish) in the morning and Khichuri (a mixed dish with rice,lentils and vegetables all stewed together) and bhaja (it literally means fried,in food it refers to fried veggies). As in Ashtami, during Navami also Mahasnan andShodashopacharapuja are offered to Devi. In addition,bali and Homa are performed. The Homa (fire sacrifice) is a combination of Vedic and Tantric traditions. Non Veg food is eaten on this day. In the morning a brief Puja, Shital bhog (cooling food offering) and Arati are first done. 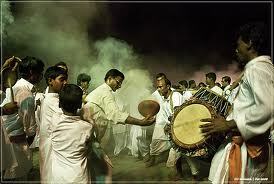 Then the Pujari and Tantradharak circumambulate the altar and perform the visarjan ritual. In this ritual the Devi, who had been invoked in the Navapatrika and consecrated Image, is entreated to return to Her celestial abode. The Divine Mother, however, dwells for ever in the hearts of devotees. In the evening the Image of Durga along with Navapatrika is taken in procession to the river bank and immersed in the river. The water taken from the spot, known as Shanti Jal is sprinkled on the devotees who embrace one another as an expression of their solidarity as children of the same Divine Mother. And thus the holy Durga Puja comes to an end leaving joyous memories in the souls of people. 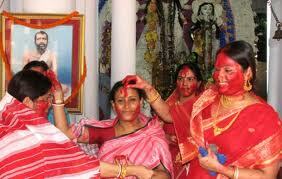 Married women bid goodbye to the mother by playing Sindoor Khela (vermillion powder,which is a sacred symbol for all married Hindu women is used to color faces of each other and the goddess).